There are several different Control Quality tools and techniques you should know for the PMP Certification Exam. The following diagrams include two examples of ways to control the quality of your project. A cause-and-effect diagram, which illustrates how one or more factors can lead to a problem or defect, can be very useful when you’re performing a root-cause analysis of a problem or defect. By working backward from the defect, you ask How did that happen? or Why did that happen? These questions lead to the inputs to the process or the product that could be potential causes of defects. You can break each branch of the diagram into limbs and continue to decompose them until you have sufficient detail to identify the source of the problem. A cause-and-effect diagram is also known as a fishbone diagram or an Ishikawa diagram. Expect to see any of these terms on the exam. Analyzing the cause-and-effect diagram, you can analyze how each of those variables could have an impact on a theoretical problematic help desk. Time: The time of day can affect the number of people staffing the help desk and the number of people at work. Energy: There have been instances of the Automated Call Distribution (ACD) system spontaneously rebooting. No one knows why. Equipment: The ACD hardware and software itself could be causing some of the problems. The headsets that the employees are using are outdated, and sometimes cause static. Measurements: The measurements for the ACD metrics are measuring the call start from the time a person picks up the phone, not from the time the call goes into the ACD queue. Personnel: There is a high turnover for employees on the help desk. The average tenure is six months. Even though staff members might have the technical skills, they’re not familiar with some of the legacy software or the policies and procedures at Cynergy2, Inc. Environment: The help desk staff doesn’t have cubicles, and they sit near the break room, where people tend to congregate and chat. There is a lot of background noise. Any of these factors could be broken down further. For example, the personnel branch could be broken into orientation and training on legacy systems, policies and procedures, and the basics of network troubleshooting. A scatter diagram shows the relationship between two variables. 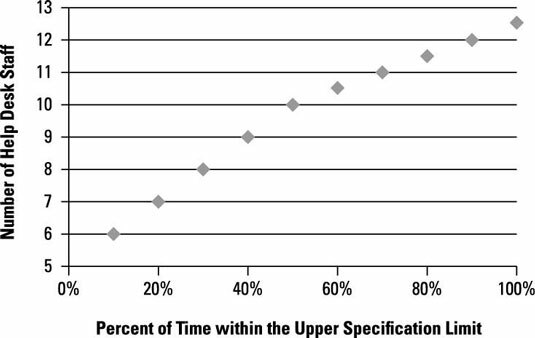 To help diagnose a problematic help desk, imagine that Karen measured the relationship between the number of help desk staff and the percent of time the help desk was within the upper specification limit. There was a positive correlation, which means that as one variable increases, the other increases. 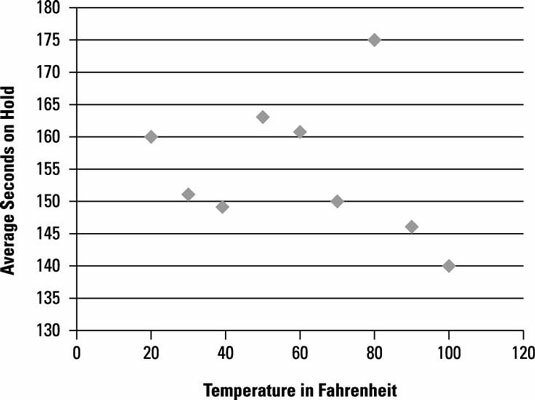 A perfect 1:1 correlation gives you a straight diagonal line. 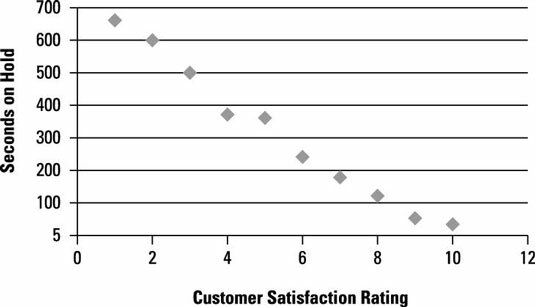 The next thing Karen measured is the relationship between the hold time and the customer satisfaction rating. This result showed a negative correlation, where an increase in the hold time leads to a decrease in the satisfaction. Karen was curious whether there was any relationship between the day of the week and the hold time. As it turns out, there was a curvilinear correlation, which means the ends of the measurements are relatively even and there is an increase or decrease in the mid measurements. 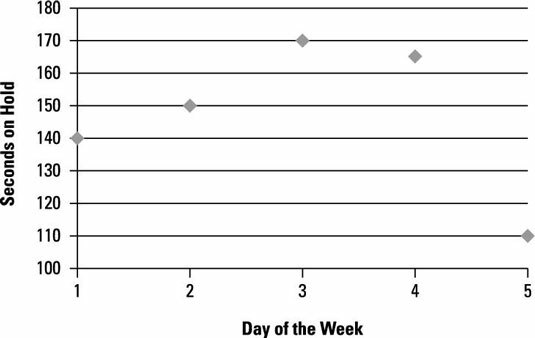 Hold time was less Monday and Friday than Tuesday through Thursday. Finally, she wanted to see whether the weather and temperature had any bearing on hold time. She thought that maybe more people skipped work when it was nice outside. The results were random, however, indicating no correlation. Based on Karen’s research and analysis, she can make some recommendations for changes to the process, including some corrective actions, to bring the results in line with expectations. The final technique is inspection. Inspection can be used to determine whether the results comply with the requirements, much like in the Validate Scope process. It can also be used to validate defect repairs and other approved changes.